This page highlights some of the amazing resources that the states of Tennessee and Louisiana have to help students with the Free Application for Federal Student Aid (FAFSA) and support them through the post-secondary pipeline. Tennessee Promise is both a scholarship and mentoring program focused on increasing the number of students that attend college in our state. It provides students a last-dollar scholarship, meaning the scholarship will cover the cost of tuition and mandatory fees not covered by the Pell grant, the HOPE scholarship, or the Tennessee Student Assistance Award. tnAchieves is the partnering organization to the TN Promise Scholarship in 84 of the 95 counties in Tennessee. Our mission is to increase higher education opportunities for Tennessee high school students by providing last-dollar scholarships with mentor guidance. College For TN is Tennessee's resource to help students and families plan, apply and pay for college. Governor Bill Haslam proclaimed January 12, 2017 as TN FAFSA Frenzy Day. Although TN FAFSA Frenzy officially began in October with the opening of the FAFSA online form, TN FAFSA Frenzy Day is focused on assisting as many students as possible with their FAFSA prior to the Tennessee Promise FAFSA deadline on January 17, 2017. During TN FAFSA Frenzy Day, volunteers from the Tennessee Higher Education Commission, Tennessee Student Assistance Corporation, nonprofits, and Tennessee higher education campuses will visit public high schools to help students and families complete the FAFSA. Louisiana Believes is built on the premise that Louisiana students are just as capable as any students in America, and that those closest to children – parents and teachers – are best positioned to help students achieve those expectations. Most Louisiana high school graduates are eligible for some form of merit- or need-based financial aid. Students can apply for state and federal financial aid by submitting the Free Application for Federal Student Aid (FAFSA), which can be used at four-year universities, two-year community colleges, and technical training programs. Louisiana's first choice for college access by promoting and providing various financial assistance programs and services. Select Louisiana High schools compete to see which school has the most FAFSA completions. The New Mexico Pubic Education Department (NMPED) is preparing students for college and career success by asking them early on to consider the financial aid they will need for post-secondary education. 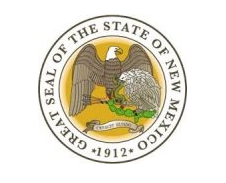 As part of New Mexico’s state graduation requirements, students in grades 8-11 are required to fill out an Interim Next Step Plan, and complete a Final Next Step Plan in grade 12. The purpose of the plan is to target the student’s postsecondary interests, set forth the studies he or she will complete during high school in order to be on track for graduation, and identify potential financial aid opportunities that will help them achieve their post-graduation goals. You can learn more about the Next Step Plan at the NMPED College and Career Readiness Bureau page. The New Mexico Public Education Department’s Early College High School Resource Center provides students and parents with information on filling out FAFSA, and applying for financial aid, scholarships, and grant programs. They also produce a podcast exploring best practices in New Mexico’s Early College High Schools. The New Mexico Higher Education Department provides guidance on how to fill out and submit FAFSA forms. They also administer a number of scholarships and financial aid grants for all types of students, including high-achieving undergraduates, graduate students belonging to underrepresented ethnic groups, firefighters, peace officers, and veterans. New Mexico’s Legislative Lottery Scholarship Program pays a portion of tuition for students who are enrolled in a public university and have a 2.5 or greater cumulative GPA each semester of enrollment. About 26,000 New Mexico students benefit from this program. The Teacher Loan-For-Service program is just one of the ways New Mexico is working to proactively recruit top-tier teaching talent. This program provides students with the financial resources needed to complete or enhance their post-secondary teacher preparation education. The New Mexico Scholars Program is available to full-time undergraduate students who have graduated from a New Mexico high school in top 5% of class or obtain a score of 25 on the ACT or 1140 on the SAT. The New Mexico Graduate Scholarship was created to increase graduate enrollment at public postsecondary institutions for students from groups underrepresented in graduate education. Each scholarship is awarded for period of one academic year. A recipient who remains in good academic standing in his/her course of study, as determined by the institution, may receive the scholarship for a total of two years for master’s degree program students. The Vietnam Veteran’s Scholarship is a state scholarship for resident undergraduate and graduate students that provides tuition, fees, and book allowances to Vietnam Veterans certified by the New Mexico Veterans’ Service Commission. The Fire Fighters and Peace Officers Survivors Scholarship is a state scholarship that recognizes the importance of the duties performed by our fire fighters and peace officers who have lost their lives in the line of duty. The scholarship provides the survivors with an opportunity for a college education through a scholarship. The NM Student Incentive Grant is for resident undergraduate students with substantial financial need who are attending a New Mexico public college or university or tribal college. The College Affordability Grant is in place to encourage New Mexico Students with financial needs, who do not qualify for other state grants and scholarships, to attend and complete educational programs at a New Mexico public college or university. The purpose of the Allied Health Loan-For-Service is to increase the number of physician assistants in areas of the state which have experienced shortages of health practitioners, by making educational loans to students seeking certification/licensure in eligible health fields. The Albuquerque Community Foundation is a public charity that administers scholarships and financial aid to over 1,000 New Mexico students through 19 student aid funds. 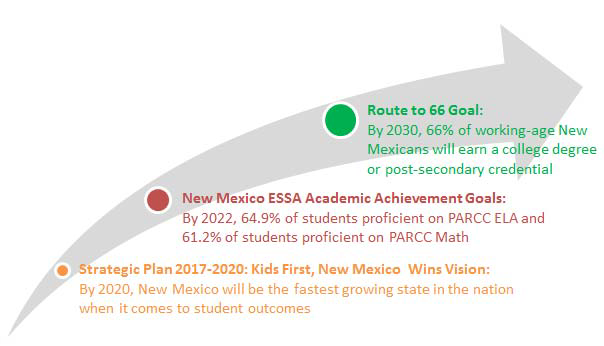 The New Mexico Public Education Department believes that every one of the New Mexico’s children can succeed. A student’s ethnic background, socio-economic status, primary home language, prior academic experience, or home community within the state is not an excuse to lower expectations for our students, our schools, or our educators that serve them. The goals above set New Mexico on the path to achieve the even greater ‘Route to 66’ goal. By 2030, New Mexico hopes to increase the number of working-age New Mexicans who will earn a college degree or post-secondary credential to 66%.